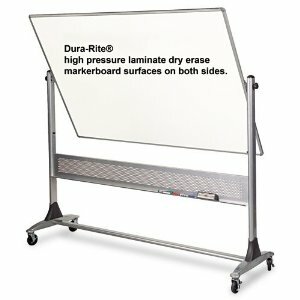 The Dura-Rite 72″ by 48″ large dry erase whiteboard is an impressive product that deserves a high rating. The entire stand and components are made with quality materials and the overall presentation is second to none. This large white board has, as mentioned, both sides covered with dry erase material. The board is capable of being turned to the second side easily by hand using the knobs designed just for turning and locks into place to keep the board upright and easy to use after rotation. After turning, the Dura-Rite board can be again rotated in the same direction to come back to the same side. Some other, lesser quality, boards must be turned back in the opposite direction. Widely spaced legs with attached rollers offer stability – an important feature to consider when looking at a large portable dry erase board. 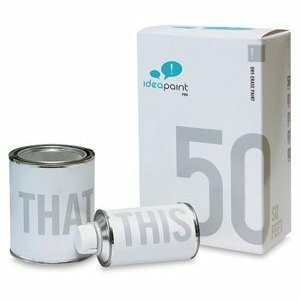 If this is not done correctly in the product design, the result can be a whiteboard that will tip easily or be difficult to use due to shaking when writing on it. The construction of the base and edges are done with aluminum, and as you can see in the pictures, gives the whiteboard a very solid feel and look. Having the tray out of the way, yet still handy slightly below the writing surface is another good design point – subtle, yet important. Attached to the dry erase marker tray is a wide aluminum cross brace that looks nice and helps increase the stability and functionality of this whiteboard. If you are considering using a board that will be moved around via the whiteboard’s wheels, then you should seriously consider this one. The sturdy construction will allow you to have it for many years without it falling apart of being difficult to use – a problem with some more cheaply constructed systems. Be sure to properly care for your whiteboards; some larger whiteboards can be a real investment – simple and regular cleaning and maintenance can make your surface last for many years.